The long mystery surrounding hypnosis is revealed as more and more people are discovering that self-hypnosis is possible. There are specific steps one can take to create and record a program that brings about self hypnosis and real and lasting changes in their lives. In order to hypnotize ones self or others a complete state of relaxation must occur. This is referred to as the alpha state of consciousness. When you are fully awake, aware and focused on your surroundings you are in a beta state of consciousness. The alpha state, which is the beginning to hypnosis, is similar to being completely relaxed and comfortable such as when drifting off to sleep. However, this is also the state you are in when you are fully engrossed in a book, computer game or even while driving a familiar route. Contrary to what many people believe, those under hypnosis are still aware of their surroundings. People who have claimed that they have never been able to become hypnotized may not realize that you don’t have to be mesmerized in order to have been effectively hypnotized. When creating a self hypnosis program to change a behavior 5 basis steps occur. In the first step, known as induction, the hypnotized person is brought to a relaxed state. Secondly, there is a deepening of the relaxation that can still be an awakened state or an even deeper state of relaxation bordering on sleep. In the third stage, scripts or dialogs are introduced that suggest behavioral changes. Fourth, is the state designed to keep the hypnotized person from over analyzing what they just heard in the script stage. It is often called the amnesia stage. Finally, the trance is terminated either by becoming more awake or being allowed to go into deep sleep. 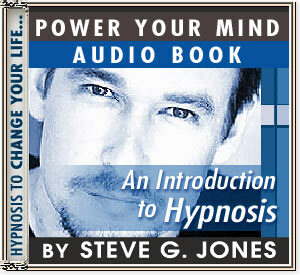 Clinical Hypnotherapist Steve G. Jones has outlined and described in detail how to create your own hypnosis sessions to change specific things in your life. You can begin using the techniques from this audiobook immediately or let him customize a program specifically for you. “An Introduction to Hypnosis” lets you tailor a hypnosis therapy specifically for you all on your own. A Practical, fun, conversational-style guide to getting started in hypnosis. Whether you want to earn up to $100 per hour as a hypnotherapist, or you just want to hypnotize yourself and friends, this Book on MP3 is for you!!! The little “tricks of the trade” which transform a good hypnosis session into a POWERFUL one! How to hypnotize ANYONE for ANYTHING. AND, by following along and completing the easy-to-understand lessons, you will make your own self-hypnosis tape which you can use or share with friends! I’m sure you know that I enjoy hypnotherapy. I feel that hypnosis is rewarding on a personal and a professional level. I am able to make a living practicing hypnosis, but I also get a lot of fulfillment from it. I think that everyone should be educated on hypnosis whether you want to practice it or become hypnotized or to just learn more about it. And I get so much satisfaction from teaching others all that I know about hypnotherapy. I get calls and emails from lots of different people around the world with questions about hypnosis. I have an audio book called “An Introduction to Hypnosis.” This audio book is for anyone who wants to learn the basics of hypnotherapy. Perhaps you are looking for a new career and you want to see if hypnotherapy is the right path to take. Or perhaps you would like to learn hypnosis so that you can use it on yourself (self-hypnosis). No matter what you reason is for learning about hypnosis, this audio book is a great way to learn! My audio book has six different chapters; five of which I talk about the five components of every hypnotherapy session: induction, deepening, script, amnesia, and trance termination. I guarantee that you will learn a very powerful technique.